In case you haven’t heard, Whole Foods is keeping it healthy and fresh with more than just green groceries. As part of its fifth annual Beauty Week sale, the supermarket is inviting you to stop by its beauty aisles stocked with natural products – and everything is 25 percent off. From plant-based oils and makeup brushes to nail polish and perfume, the entire beauty section is up for grabs, and Amazon Prime members who participate in the sale get an additional 10 percent off, because Black Friday isn’t the only time of year to treat yourself. A limited stock of Beauty Bags – valued at $100 each – will also be available beginning March 29 for only $20, while supplies last. Customers will be able to choose between the All-Day Beautiful Bag or the Self-Care Sunday Bag, both of which include a selection of the company’s newest and most loved natural beauty products. Curious what makes these products so natural? 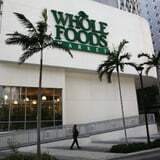 Whole Foods has shared a list of over 100 ingredients banned from its natural beauty products line that are common in other skin- and hair care brands, such as harsh preservatives that damage the environment and the skin. The brand even includes a Premium Body Care standard seal on products that meet a higher standard of “natural,” excluding a list of over 400 unacceptable bodycare ingredients – and we are all about Whole Foods’ decision to promote cleaner beauty products. The only catch? While Whole Foods’ beauty products are available year-round, the annual beauty sale will only last for a week, from March 27 to April 2. It may not seem like a lot of time to stock up, so make sure to stop by the beauty aisle during your next grocery trip to get your hands on some all-natural beauty essentials. Your skin (and your wallet) will thank you. Previous articleKristen Bell and Dax Shepard Could NOT Keep It Together While Playing the "Not-So-Newlywed Game"